Alaska has long been a solidly "red" state but this year the troubles of the state's Senator Ted Stevens and Representative Don Young on top of Republican party "brand" troubles suggested there might be an opportunity for the Obama campaign which spent $88,000 in advertising in the state in June and July according to the Wisconsin Advertising Project. And then came Sarah Palin to the Republican ticket. The impact is obvious in the chart above. While the state was classified as "lean Republican" prior to the Palin Pick, all but one poll in the state showed McCain ahead. Now there is no doubt. 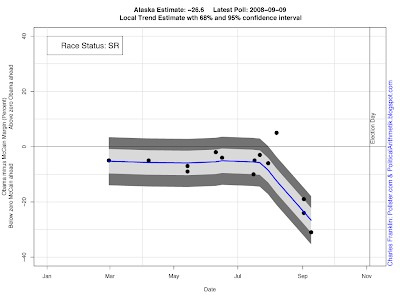 The politics are obvious, of course, but it is a nice example of how a political event can be instantly reflected in the polling, and bring our trend estimator to a sharply different conclusion.